Also known as Gray’s Lupine, this is a common, low-growing lupine that can carpet the forest floor with color in the late-spring and early summer. The flowers are most often a rich purple-blue color, but also come in shades of pink and white. There is a lovely plant that grows just above my house here in Tahoe that has light pink flowers with a raspberry-colored splotch on the banner petal. 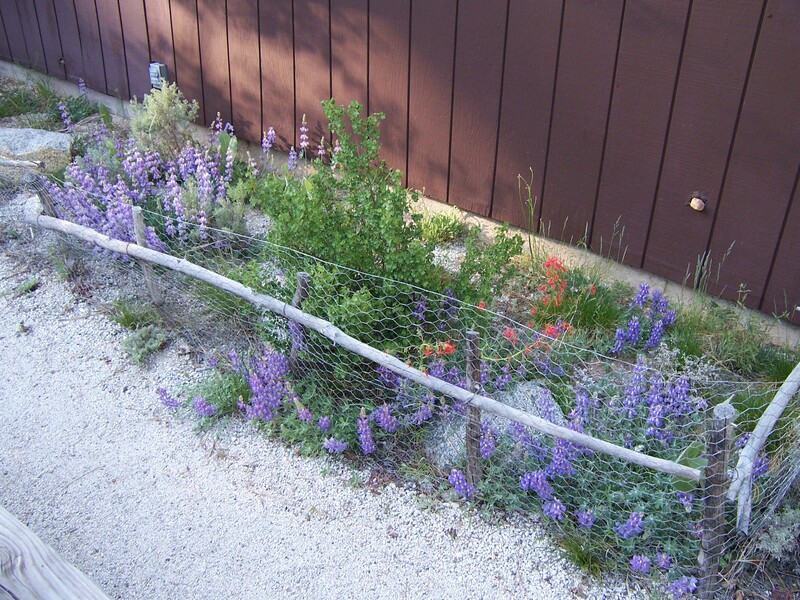 (Shown at the bottom of this post) In my yard, Lupinus grayi ranges from about seven inches to sixteen inches tall when in bloom, with a spread of up to two feet. Some plants can be quite fragrant. 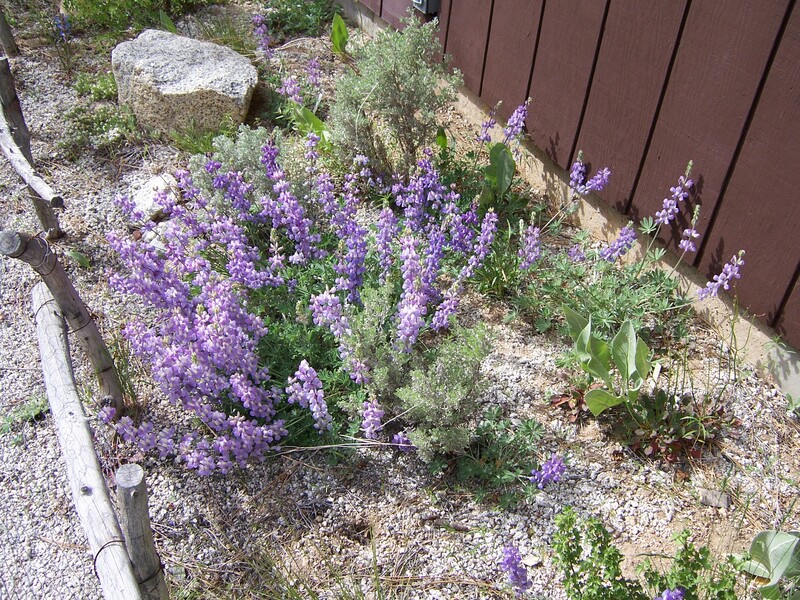 This lupine does well in hot, dry areas in full sun, and in partially shaded locations. I’ve observed bumblebees pollinating the flowers. Chipmunks and Douglas Squirrels like to eat the unripe seeds. Lupines are in the pea family, but the seeds are poisonous to humans. In the dry garden, Lupinus grayi is easy to grow, flowering in its second year. Some plants take longer to bloom in severely depleted soil. 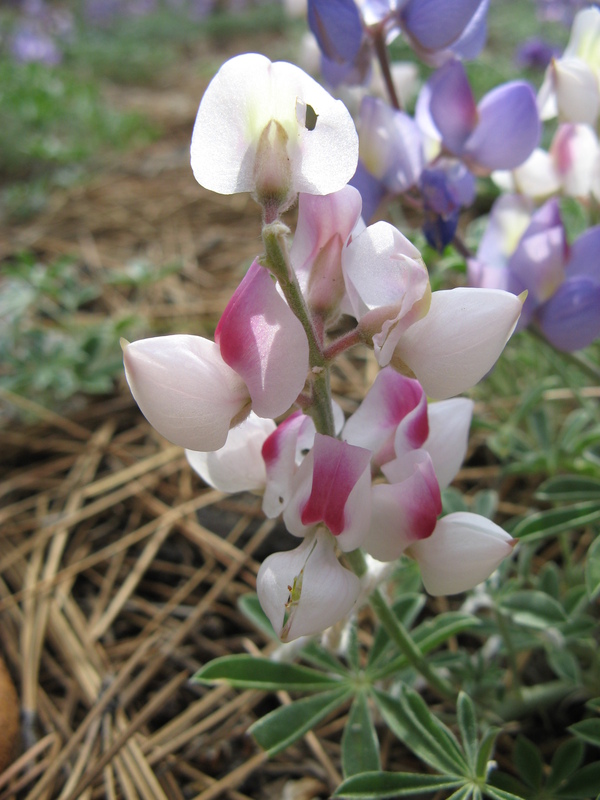 However, being nitrogen-fixers, lupine species do well in soil with few nutrients. Several years ago my husband and a friend removed part of our driveway. This lupine species was the first thing I planted in the compacted, sterile-looking soil that was underneath the asphalt. The plants seemed unfazed by the poor soil. This is a species to consider when confronted with a totally bare yard where previous residents have spent years meticulously removing pine needles and other organic matter from the soil surface. 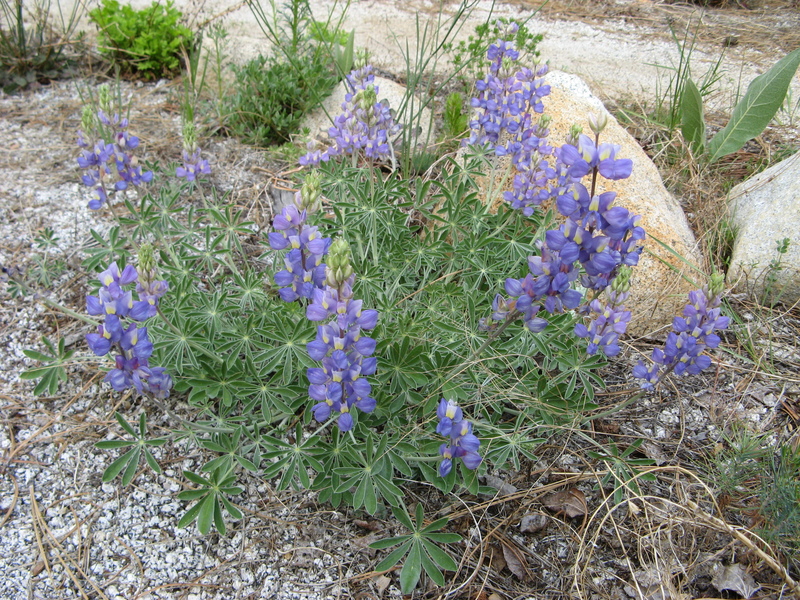 Lupinus grayi is good for revegetating bare roadcuts, and other hot and sunny or partially shaded slopes. It seeds around quite prolifically. This is not a plant for the regularly watered garden. Each individual plant produces seeds with unique patterns on the seed coat. It’s fun to look at each pattern carefully. A good place to find seeds is on the street near large patches of this species. Depending on the weather, the seeds ripen in mid-July to early-August. You’ll know you have timed your seed gathering right if you can hear the faint snapping sound of the ripe seed pods ejecting their seeds. Since they resemble small pieces of decomposed granite, the seeds can be hard to see on the asphalt. Make sure to watch out for traffic, and be prepared for curious looks from the neighbors! When gathering seed pods directly from plants, you’ll know if the pods are ripe if they are dry, light-beige in color, and crack when bent. The dry seedpods can break apart easily and eject their seed when picked, so clasp your hand around them carefully. Don’t gather green seed pods, or drier-looking pods that are still flexible. The immature seeds will not germinate. I’m in the habit of always planting a portion of the seeds I gather near the plants I took them from. Direct sow the seeds about a half-inch deep in the fall or even winter, if there is little snow. I often wait to plant seeds until the chipmunks go into hibernation in mid-fall, otherwise, there is a chance they could dig the seeds up after they have been planted. Spring planting (March or April) can work if the seeds are scarified and briefly soaked in warm water. To scarify a seed, carefully chip off a tiny portion of the seed coat with the edge of a knife. Put the scarified seeds in a bowl and pour warm water over them. The seeds will absorb water and swell up significantly. It can take a few minutes to several hours for the seeds to absorb water. Try to plant the seeds immediately after they swell up. 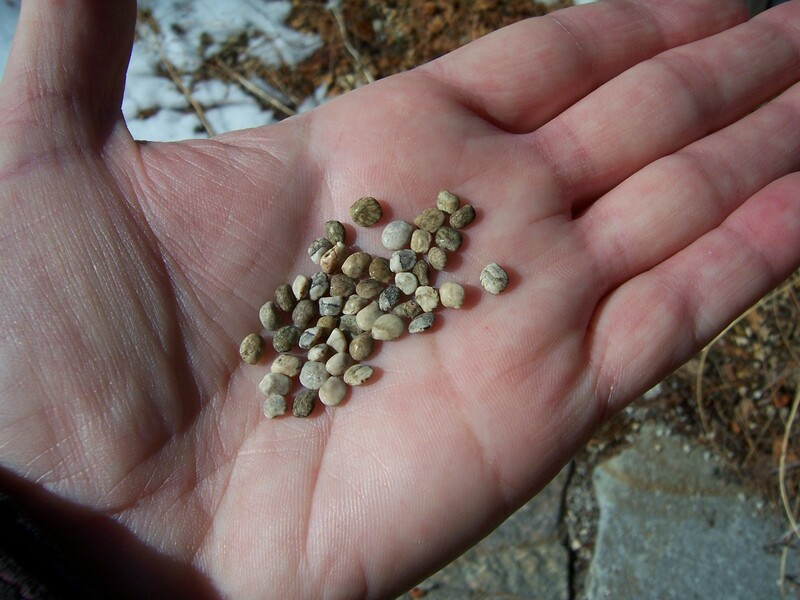 Germination usually occurs a few weeks after the snow melts off the soil. I have not had success planting lupine species any later than April. The young seedlings seem to be able to tolerate cool, moist soil but tend to rot if they are going through germination during those warm May days when the soil is still saturated. Lupinus grayi blooms around the same time as many other colorful, dry-growing native plants like Phlox diffusa, Buckwheat species such as Eriogonum umbellatum and Eriogonum ursinum, Linanthus nuttallii, Calochortus leichtlinii, Penstemon speciosus, Wyethia mollis, Ipomopsis aggregata, and Calyptridium umbellatum.